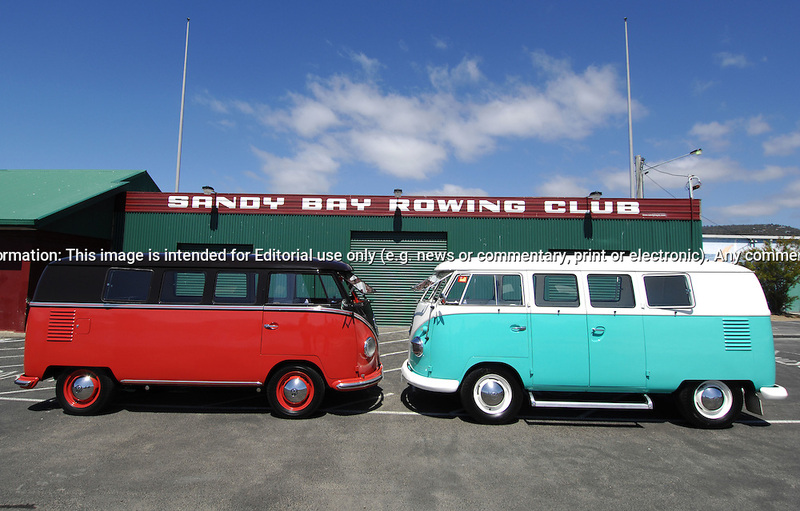 1955 Volkswagon VW Kombi Bus.Chestnut Brown & Ceiling Wax Red.1962 Volkswagon VW Kombi Bus.Green & White.Sandy Bay Rowing Club.Sandy Bay, Hobart, Tasmania .16th February 2008.1955 model, It was built in the Wolfsburg Factory in Germany on 23rd of March 1955. It is a very rare bus indeed, as they were not built in that factory for very long. Less that 6 months of production. It is one of the earliest 55s in the world. It is specked as a Deluxe, with all genuine original parts (No reproduction parts used, apart from side step). It is running 1968 lowered beam & brakes It is also running a 1641 Remtec motor; with twin type 3 carbs, an L-Bug gearbox & IRS suspension.. 1962 model, very rare bus, as is 100% original steel. When found, was completely unrestored & in perfect, rust free condition. Basically stock running gear, apart from a later model gearbox & a 1600 motor..(C) Joel Strickland Photographics.Use information: This image is intended for Editorial use only (e.g. news or commentary, print or electronic). Any commercial or promotional use requires additional clearance.